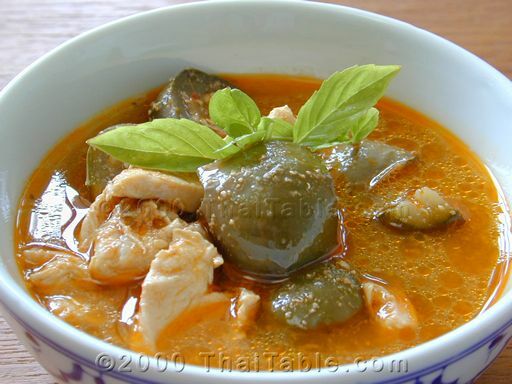 Chicken curry is a staple at any to-go curry vendors in Thailand. Chicken curry is eaten with rice or 'kanom jeen' noodles. You can see chicken curry's popularity when you go to a temple in Thailand; Thai people frequently bring the classic dishes like chicken curry to temples to offer to the monks and other temple patrons. Traditionally, a whole chicken--bones and all, is used to make chicken curry. The bones help make the dish flavorful. However, picking out bones during a meal is undesirable, chicken breast meat is called for. 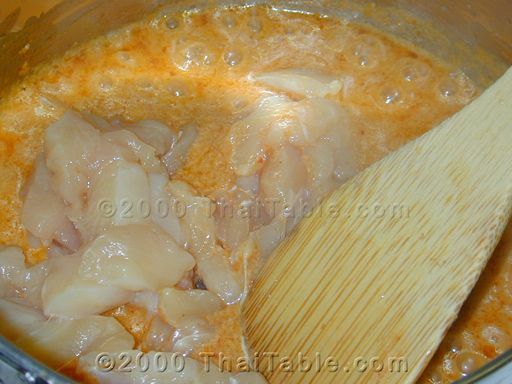 If you have chicken bones, thigh or leg, drop some into the curry. I use Thai eggplants, the golf ball size ones. But, they can be difficult to find. Regular eggplants that you find in supermarkets are a good substitute. 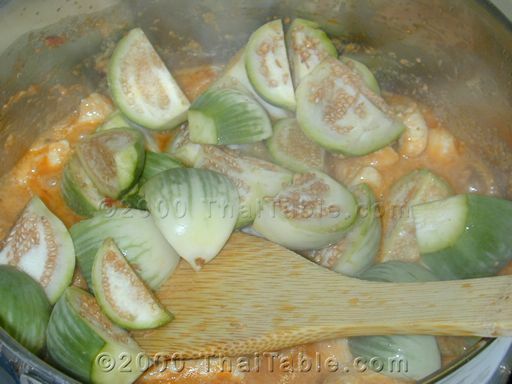 If you have the Thai eggplants, cut them up into quarters. If you have the regular eggplants, cut them into bite size pieces. Wash and pick the basil leaves. Cut up the chicken into bite size pieces. If you have this dish in Thailand, you will see that the chicken comes with bones. All parts such as legs and thighs can be used. The bones make the curry more flavorful. 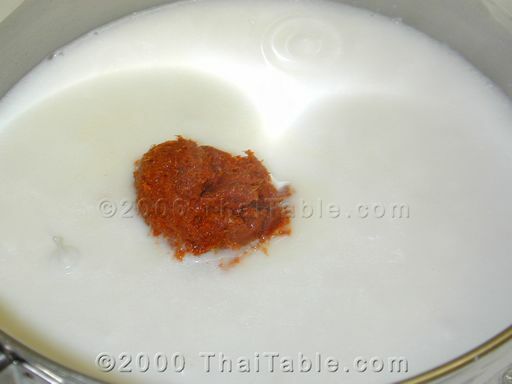 Pour half of the coconut milk into a large pot, over low to medium low heat. Add the red curry paste. Break up the paste and mix it with coconut milk. Stir constantly. Lower the heat if it splatters too much. Add chicken when you see red oil bubbling on top. 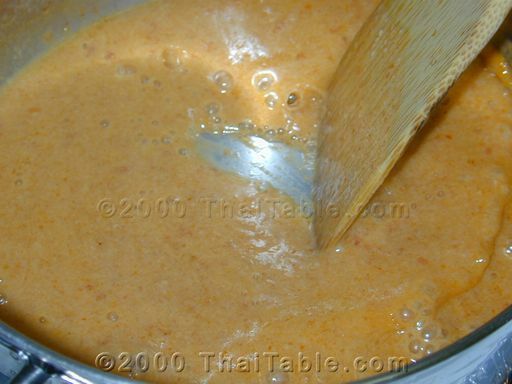 Stir and coat chicken with curry sauce. Add the eggplant when chicken starts to turn white. Add the rest of the coconut milk and water and the fish sauce. Let it boil until all the eggplant pieces turn dark and tender. The longer you boil the curry, the thicker the curry becomes because the eggplant disintegrates and thickens the sauce. Pull the center stem off from the kaffir lime leaves and add them to the curry. Add the basil leaves just before you serve and make sure the leaves are submerged quickly in the curry to preserve the color. Serve hot with rice or rice noodles.